I feel so pretentious even writing ‘quail eggs’ in the title of this. Suddenly, it’s like I’m on Posh Nosh and I should be writing a recipe which says things like ‘mellifluously confuse the quail eggs until they are a pale primrose in colour’ (which I think means scramble them gently, but I don’t actually know for sure, even though I’m the one who made that sentence up). But this isn’t about being posh – it’s about me having these fascinating little quail eggs and wanting to showcase them somehow! It would work just fine with hen’s eggs. This recipe is a bit on the fiddly side – all that shelling and skinning of broad beans and then shelling teeny tiny quail eggs – but took less time to make than I expected. 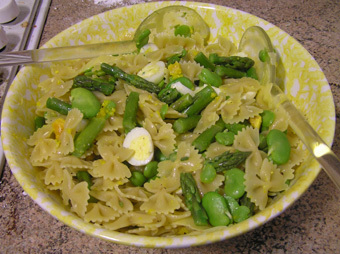 I think I started fiddling around with eggs and broad beans a bit after quarter to seven and we sat down to eat a bit before seven thirty, which is not bad in my view – though of course I was doing stuff all that time and the reason it didn’t take long is that none of the elements needed long to cook. I did make a salad at the same time, though, so I wasn’t wholly occupied. On the other hand, it’s such a beautiful recipe for spring – all yellows and spring greens and very fresh tasting. Do make sure you season it enough – I didn’t, and it definitely needed more salt. I’ll probably play around with it more to perfect it. Also, I must confess that the recipe is somewhat vague in its quantities. Sorry about that. I think it’s fairly forgiving, nonetheless. 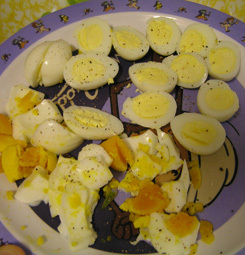 8 quail eggs + 2 hens’ eggs, or 16 quail eggs or 4 hens’ eggs. Or use duck eggs! Whatever they are, make sure they are free range. Get the broad beans out of their pods. You don’t need a knife for this, and it’s quite fun – I don’t even have thumbnails and I can still open a broadbean pod. Once they are podded, put them into a bowl, pour over enough boiling water to submerge them, cover the bowl and leave while you prepare the eggs. Next, boil the eggs. 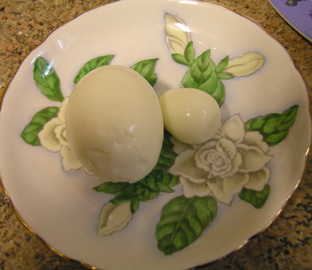 You’re aiming for a softish hard-boiled egg; I put the eggs into the water cold, and cooked the quail eggs for just under 3 minutes after they hit the boil, and then gave the hens’ eggs another 2 minutes. Let cool while you deal with the broad beans. Tell me these aren’t the prettiest eggs you’ve seen. See, you can’t. That’s because they are totally and uttely adorable. Drain the beans and put back in the bowl, this time with cold water. You should be able to slip them out of their skins by squeezing them from the end where they were originally attached to the pod. This causes them to shoot across the room. You could aim for the cat or your husband, but I don’t recommend this. Fill a smallish saucepan with salted water and bring it to the boil. Put on a stockpot full of water for the pasta at the same time. Chop the asparagus into lengths about an inch and a half long, and add to the water once it is boiling. Let simmer for a minute or two, then add the broad beans and simmer for a couple more minutes. Drain, and put into a serving bowl. Toss with salt, pepper and a little olive oil. Cook the pasta until it is al dente. Meanwhile, use a vegetable peeler to shave your parmesan into ribbons. 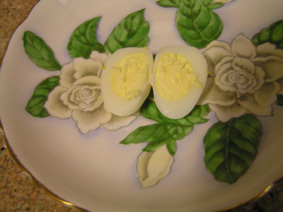 Shell the eggs and halve the quail eggs or chop the hens’ eggs, season, and add them to the bowl with the greens. When the pasta is done, add to the bowl with the parmesan, and toss everything together. You may need to add more salt, pepper and olive oil. It’s not hard to make this one gluten-free with a suitable pasta, and I think you could make a lovely dairy-free version of this using garlicky breadcrumbs instead of the parmesan. Making it without the eggs is sort of defeating the purpose, however. 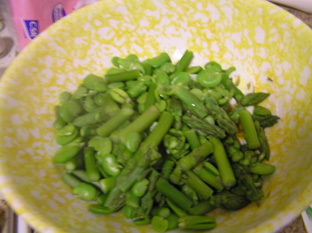 You could use green beans or fresh peas instead of the broad beans, or to replace some of them. Otherwise, I’d be inclined to leave this recipe pretty well alone. Thank you! I’ve actually only ever seen bits and pieces of Posh Nosh, but clearly I need to see more. This looks amazing! I’ve only had quail eggs once and it was a long time ago, but I remember them being delicious! Thank you! I did love how all the greens and yellows came together for this one.